Water fountains are everywhere in the city, if you know where to look. If you want to eliminate single-use plastic from your life, ditching bottled water is a good place to start. Once you have a reusable water bottle, you can refill it with fresh Sydney water at one of many stations around the city. There’s a large network of water bubblers and water fountains dotted around the city. Most are in parks and playgrounds but some are along main roads or near tourist attractions. 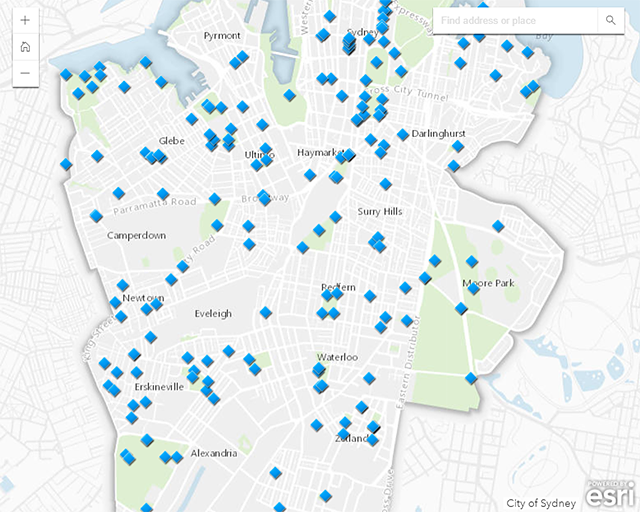 View a map of water bubblers by clicking the image below. Our water fountains are not only useful, they are something of a tourist attraction in themselves –with some more than 100 years old. In the early 20th century, shared taps and drinking cups were deemed unhygienic. Water bubblers solved the problem by enabling a person to drink without bringing their lips in contact with the tap. Some of our early water fountains were converted into bubblers, but their historic architecture still remains. Check out the sandstone, baroque-style fountain near The Domain or the cupid-topped fountain on the corner of Pyrmont and Edward streets and Pyrmont Bridge Road. The water that flows from our taps is mostly rainwater from natural catchment areas, including world heritage national parks. Every drop is filtered and tested to meet government health and safety guidelines, which are some of the strictest in the world. Bottled water, however, is classified as a food product and falls under the food standards code. Apart from its country of origin, this code doesn’t require the manufacturer to state what type of water it is and where it comes from. Unlike tap water which is stringently tested, this means bottled water can contain unfavourable mineral and acid levels. Around 373 million plastic water bottles end up as waste each year. Each bottle can take up to 1,000 years to break down. It also takes energy to make, distribute and dispose of the bottle – the process includes extracting, manufacturing, transporting, refrigerating and disposing. Transporting bottled water is a big environmental issue. If the bottle is transported over long distances, its energy costs are comparable to the energy used to produce the bottle itself. A US study showed that altogether, producing bottled water takes 2,000 times the energy cost of tap water. Make sure your reusable bottle is BPA (Bisphenol A) and phthalate free. If it has removable parts, even better. This will ensure you can clean it properly. Also consider the weight and breakability of the material. Keep the bottle in your bag and be confident that with water bubblers dotted around the city, you’ll never need to go thirsty. Posted 19 July 2018 .